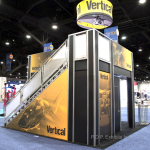 Typical Cost of a Double Deck Exhibit – P.O.P. Exhibits Inc. 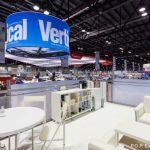 If you’re looking into a Double Deck Exhibit for your next trade show, you likely already know about all of the benefits. 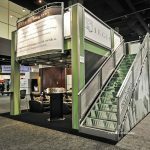 Storage space, private meeting space, ample branding space, an impressive view, added visibility to name a few… But these impressive structures come with a price tag, and if you’ve never looked into a Double Deck before, understanding the price and what all is included can be intimidating. We’re going to attempt to break down pricing for our most basic Double Deck Exhibit below. We’ve believe that the 9’ x 17’ deck is the most popular size for most first time Double Deck users. 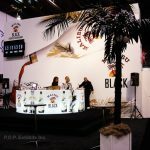 It fits comfortably into a 20 x 20 Island space while still giving room in front of the deck for seating or product demonstrations. The upper deck is also large to be useable and not too cramped (as a 9×9 would be). There’s space for a coffee bar plus seating area! The base price to rent the 9’ x 17’ deck is $29,800.00 with accessories and furnishings. From $25,000.00 without accessories and furnishings. Purchase pricing for this deck starts at $90k. Back wall and enclosed locking storage under landing. Graphics aren’t included on the back wall but can be added. The back wall is also a great place for shelving or monitors. Nearly $30k is a lot of money, but when you consider that it’s an entire structure that needs to be shipped, built and disassembled in a matter of days it’s really quite impressive that it doesn’t cost MORE! 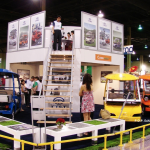 Plus when you consider the benefits of the added space, privacy and WOW-factor a Double Deck Exhibit provides it really is a great potential investment for your company. 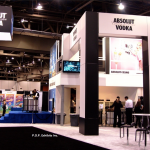 In addition, many single level displays can easily cost more than that depending on the design and finishes you choose. The pricing above is just the basics, of course. You’ll likely want to consider adding things like additional graphics, furnishings, monitors, an overhead sign, workstations, etc. 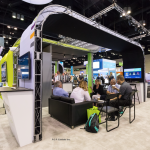 to help dress up your booth a bit more. 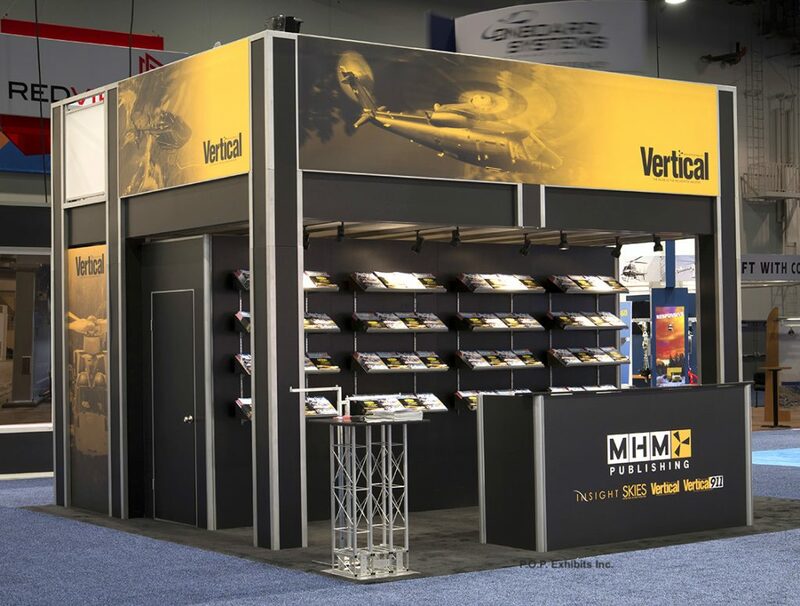 You can view rental accessory pricing as well as overhead sign pricing on our site. Graphics were added to the railings here as well as back wall shelving to display magazines. Additional storage can also be added by pulling out the back wall. Show orders- these include electrical, rigging, daily cleaning, etc. We’re happy to help and provide recommendations for your show orders, but these aren’t included in our guaranteed pricing as they come from the show, not us. Drayage- This is a charge the show contractor charges to transport and store exhibit hardware. Drayage costs vary greatly from show to show, but for this deck will likely run you an additional $5k-$10k. This particular deck weighs approximately 5,000lbs. You can estimate your drayage costs if you know a few details that can be found in your shows manual. You might be wondering why we don’t include the cost of show orders and drayage in our all inclusive pricing. The answer is simple: it decreases our liability and saves you money. 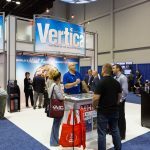 There ARE exhibit companies you can find who will provide all-inclusive pricing. However, you’ll end up paying a lot more for that service. We prefer to only guarantee pricing on the things we’re confident in, which are our products, shipping and install & dismantling services. That said, we do our best to prepare you for these charges by providing as accurate a weight estimate possible. The first conversation will be about your company and your needs. We’ll talk through the following questions: What is your budget? When/where is your show? What size space do you have at the show? 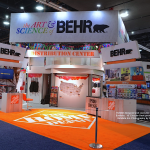 What will your space be used for (meeting space, demonstrations, product display, workstations, etc.)? How much branding will you need? From there, our design team will get to work. 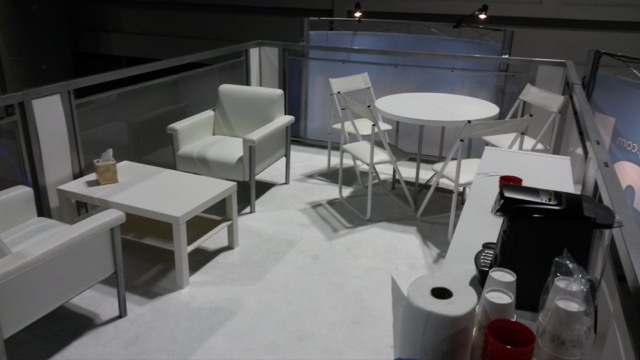 We’ll begin with a line drawing of your booth including any accessories you’ve requested. We’ll then have another conversation to see if we’ve hit the mark or adjustments need to be made. After a design is finalized we’ll provide a quote and sample rendering where we’ll drop in your companies logo and colors. This is especially useful to illustrate which panels will be printed graphics vs solid colored sintra paneling. Graphics may be added onto almost any surface of the deck, so graphic packages are highly customizable. Graphics will also highly affect the price of your double deck, which is why establishing and telling us your budget is so helpful. If we know what your limit is, we can help you decide where to best spend your money to get the most bang for your buck. If everything looks good on the quote and rendering, we’ll send your company an invoice for a 10% deposit. The full balance is due 30 days before set up. Once we have a sign off, we’ll send over graphic specs and file prep info for your designer. We’ll also provide you with information to fill out the shows EAC (Exhibit Appointed Contractor) form. This is necessary so that we can get into the show to provide installation & dismantling. 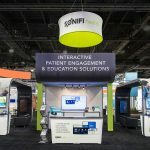 We’ll also send in our COI (certificate of insurance) into the show as required, as well as help with any fire marshall regulation paperwork needed to have a Double Deck Exhibit in that exhibit hall. Usually this means sending stamped engineering drawings into the show for approval. Upon request we’re happy to help with show paperwork such as electrical and rigging orders. You can either order downstairs carpet through us or the show. We require art files 3 weeks before the advance warehouse deadline. This will insure you won’t have rush charges from our printer or for expedited shipping. We’ll provide reminders when this deadline is approaching. Our designer will be to talk with your designer if questions come up during the design process. We’ll also request a drawing with booth orientation labeled with adjacent booth numbers. We also require that you provide us with copies if all show orders before the show. This is helpful in case someone from our install team needs to request a change or faster set up for something such as electrical or carpet. 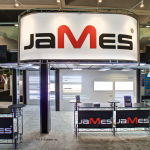 When the show is approaching, we’ll provide you with contact information for your set up lead. We’ll handle installation for you so you can show up to the show with no worries! After the show we’ll come back to handle tear-down. If you’d like to keep your graphics to use at a future show, let your project manager know before set up. We’re happy to store your graphics free of charge. You get to show up to a completely set up Double Deck Exhibit and enjoy your view! We hope this takes some of the guess work out of the process if renting or purchasing a Double Deck Exhibit for the first time is in your near future. Give us a call if you have any additional questions we can help answer!